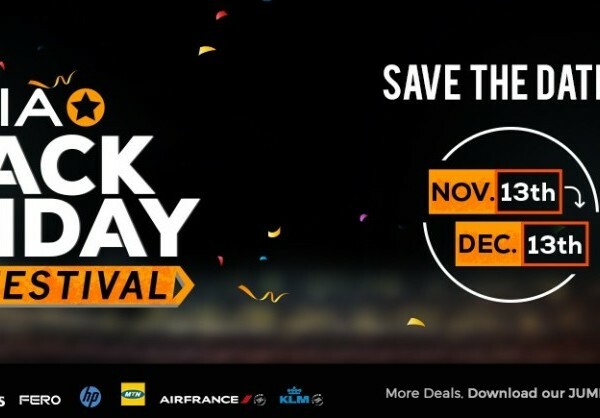 LAGOS, Jumia Nigeria announces its biggest black friday sales event ever - the 2017 Jumia Black Friday Festival, featuring 1 million deals, a lottery giveaway that includes a brand new car and roundtrip airline tickets to Europe over the course of 31 days. The much anticipated event will run from Monday, November 13th until December 13th. To ensure that Jumia brings its customers the best deals and widest assortment, the e-commerce giant has partnered with top brands including Intel, Pampers, Infinix, Phillips, Fero, HP, MTN, Coscharis and Air France-KLM. For the first time ever, Jumia has also teamed up with music entertainment company, TRACE Naija to host a MAD (Music and Deals) fest on Saturday, November 18th. The exclusive 2-in-1 concert and shopping event will feature Nigeria's finest artistes including Simi, Falz, Wande Coal, 9ice, Mayorkun, Niniola, Sound Sultan, Skales, Lil Kesh, Pencil, Jimmie DJ Consequence, DJ Cuppy, Nedu to thrill attendees to exclusive app flash sales and lots of exciting giveaways including a 500,000 naira shopping voucher! Some of this year’s surprise elements include a brand new Ford Figo from Coscharis Nigeria Limited to be awarded to the lucky grand prize winner of the 2017 Jumia Black Friday lottery. Shoppers simply have to shop during the course of the 31 day event to be eligible to win any of the prizes which includes five Air France - KLM return tickets to Europe; 20 discounted Air France - KLM tickets at 35% off and much more. Shoppers can also enjoy a 10% discount off their purchase when they make payment online using an FCMB bank account via Jumia Pay. Back on customer demand, the online Wheel of Fortune will also be churning out free shopping vouchers daily to provide shoppers with additional discounts to shop on www.Jumia.com.ng. Those who download the Jumia app, will gain special access to a special app-only deals sales event and flash sales in addition to instant notifications to snap up the best deals before they sell out. Distributed by APO Group on behalf of Jumia.